Laugh Out London is proud to present Edinburgh previews from the two award winning stars of the 2013 Edinburgh Fringe. Winner of Best Show Bridget Christie and Best Newcomer John Kearns together showcasing their brand new shows. See John Kearns perform an Edinburgh preview on June 10 in Angel alongside Liam Williams and Andy Zaltzman. Yet another show from the winner of last year’s Foster’s Best Newcomer Award. Barry Award nominee 2014. Triple nominee at the Chortle Awards 2014. What was said about last year’s show…‘Now this is how you do absurd comedy…a bold, hilarious debut…he has forged comedy gold’ (Steve Bennett, Chortle.co.uk). 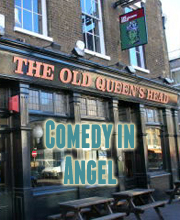 ‘A true comedy original’ (Time Out). ‘Perhaps his finest achievement is that in the course of the whole show, there’s nothing you can actually identify as a joke’ (Guardian). ‘Extremely funny’ (Scotsman). ‘Spike Milligan, Vic and Bob, John Kearns. Say hello to comedy’s latest lunatic’ (Bruce Dessau, BeyondTheJoke.co.uk).